This article is about the projectile used as a weapon by Fire Mario and various enemies. For other uses, see Fireball (disambiguation). A Fireball (also written as Fire Ball) is a common projectile in the Mario franchise. Typically, one can only shoot fireballs if he or she acquires a Fire Flower. 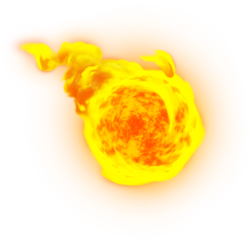 Some enemies can shoot fireballs without the use of a power-up. (Additionally, Mario and Luigi can shoot fireballs from their hand without using a Fire Flower.) Ice Balls can be seen as a parallel to fireballs. 1.8.1 The Super Mario Bros. Super Show! Fireballs make their debut in Super Mario Bros., where Mario and Luigi can shoot these fireballs only if they acquired a Fire Flower. They are affected by gravity and can bounce in the ground. Most enemies can be defeated by one fireball and Bowser can be defeated by five. Hitting Bowser and his fakes with five fireballs will defeat them and give 5000 points; the latter seven will also reveal the common enemy that was in disguise. Fireballs only appear in Super Mario Bros. 2 as enemy projectiles. Pansers shoot two fireballs at a time (gray/green ones shoot them straight up, while the others shoot them toward the player in an arc). Red and Green/Gray Birdos spit fireballs; the former also shoots eggs, but the latter does not, forcing the use of Mushroom Blocks to defeat them. Autobombs also shoot fireballs at players if Shyguys are on them. Fireballs return in Super Mario Bros. 3, being used as a projectile again. Though Mario and Luigi aren't the only ones that can shoot fireballs, as Fire Bro's can also shoot fireballs from their mouths which acts like the Mario Bros. fireballs. Due to palette limitations in the NES version of the game, the fireballs Mario and Luigi shoot appear green inside Toad Houses and blue during Koopaling fights. Fireballs appear in Super Mario World where they are used as a weapon. When enemies are hit by fireballs, they become coins. Additionally, Yoshi can breathe fireballs if he eats a Red Shell and Red Yoshi can also breathe fireballs if he eats a Koopa Shell. The fireballs that Yoshi spit out look like Lava Bubbles and destroy most enemies. In Super Mario 64, Keronpa Balls and Fly Guys spit fireballs at Mario when he is near them. The lava and volcano of Lethal Lava Land also spew fireballs at certain intervals. Fireballs also appear in Super Mario 64 DS as a stream of Fire Breath with Yoshi's Power Flower ability. They are also found by swallowing Keronpa Balls, Fly Guys and campfires. Fireballs return in New Super Mario Bros., where they have the same function as in the previous game, when Fire Mario shoots fireballs. Fireballs reappear in Super Mario Galaxy as Fire Mario's projectiles; however, the form has a time limit, and though he can shoot more than two fireballs at a time, he cannot do so underwater. Kamella and Magikoopas also shoot fireballs from their wands (the former also spawns Green Shells), and King Kaliente and Octopuses spit them and coconuts (the latter of which can be hit back at them). Fireballs appear in New Super Mario Bros. Wii, appearing when Fire Mario shoots them. Fire Bros also throw fireballs, and Fire Piranha Plants spit them out, melting any Ice Block in their way. Yoshi can also spit a giant Fireball (like in Super Mario World) by eating a fireball launched by a character with a Fire Flower power up, or from a Fire Piranha Plant. This giant fireball transforms all enemies encountered into coins. Fireballs return in Super Mario Galaxy 2, acting as they did in the prequel, though Magikoopas instead spawn Goombas. Prince Pikante also shoots fireballs and coconuts in his battle. Fire Mario reappears in Super Mario 3D Land, acting as it does in the 2D Mario games. The fireballs thrown also bounce off walls and fizzle out after a while. Fire Piranha Plants also spit fireballs. Fireballs return in New Super Mario Bros. 2 and behave as they always have. There is an extra gimmick where Fire Mario can shoot fireballs into certain pipes and coins and other items (like Mega Mushrooms) can come out the other end. Fireballs come back in New Super Mario Bros. U, acting as they did in New Super Mario Bros. Wii. Fireballs reappear in Super Mario 3D World and behave like they did in Super Mario 3D Land; they can also go through Clear Pipes and destroy any spiked balls within them. Fire Bros also throw fireballs, which can go through Clear Pipes and be put out by players' fireballs. Fireballs return in Super Mario Maker and Super Mario Maker for Nintendo 3DS due to the return of the Fire Flower item and enemies such as Fire Piranha Plants. Yoshi can also swallow fireballs from enemies that shoot them, or get fireballs from fire obstacles such as Fire Bars or Burners. Additionally, the Fire Koopa Clown Car, an object released via a software update on December 22, 2015, has the ability to shoot fireballs from its mouth, and Fire Flowers give it a triple spread-shot. A charge can create larger fireballs, which can destroy blocks. Fireballs make their debut in the Mario Kart series in Super Mario Kart, where Bowser would drop these items and touching them would make the driver spin out. Unlike other laid down items such as Banana Peels, however, they move around a bit on the course. 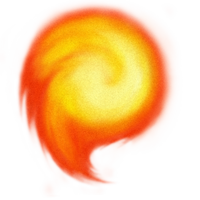 Artwork of a Fireball from Mario Kart: Double Dash!!. Fireballs reappeared in Mario Kart: Double Dash! !, where they are the special item of Mario (and Petey Piranha and King Boo, due to their ability to have any special item). Luigi's is a Green Fireball, but it acts the same. When the special item is used, five fireballs will be launched into the racetrack, hitting other drivers and causing their karts to spin-out. These fireballs are capable of ricocheting off walls. However, after a short amount of time, the launched fireballs will fizzle out. The Fireball appears as an item in Mario Kart Arcade GP, Mario Kart Arcade GP 2, and Mario Kart Arcade GP DX, in which it is one of Mario and Luigi's special items. The Fireball is one of the few items that can be thrown both forwards and backwards depending on the player's input. When thrown, the Fireball bounces across the track and ricochets off walls, exactly as it does in Mario Kart: Double Dash!!. However, only one Fireball is launched instead of five. In Mario Kart Arcade GP DX, Fire Mario's special item is the Double Fireball, which allows him to throw two Fireballs rather than one. Fireballs also appeared in Mario Kart Wii, where they could only be seen in the 2nd Competition of March 2009. Here, Dry Bowser would spit out fireballs to attack the player. He would either fire three fireballs backwards or one fireball forward, depending on the player's racing position. Fireballs appear in Mario Kart 7 where they are used as a special weapon. They can only be used if the Fire Flower item, which allows the racers to shoot fireballs forwards and backwards, is acquired. A racer hit with a fireball loses a single coin. Fireballs appear in Mario Kart 8 and Mario Kart 8 Deluxe, where they have the same use and effect as in Mario Kart 7. Fireballs also appeared in Mario Superstar Baseball, where they are Mario and Luigi's special pitch. It, unlike most other pitches, goes in a straight line. The ball, as the name says, turns into an extremely hard-to-hit fireball (red for Mario, green for Luigi). Mario uses his Fire Ball Star Pitch in Mario Super Sluggers. Fireballs reappeared in Mario Super Sluggers. Like in Mario Superstar Baseball, it is used as Mario's Star Pitch, though Luigi is given a different Star Pitch. Just like in the predecessor, Mario will throw the baseball at a fast speed, which makes it harder for batters to properly hit it. Fireballs appear as the standard special move used by both Mario and Luigi throughout the Super Smash Bros. series. Mario's Fireballs are red and affected by gravity (meaning they bounce against the ground), while Luigi's Fireballs are green and shoot straight no matter what, unless it ricochets off of something in front of Luigi. 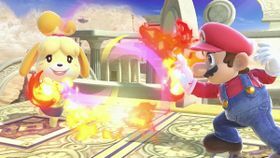 Kirby can also use the Fireball move once he has sucked up Mario or Luigi, and the color and performance of the Fireball are according to which Mario Brother he has sucked up. In Super Smash Bros. Brawl and Super Smash Bros. for Nintendo 3DS / Wii U, Yoshi can spit single fireballs in his Final Smash form. In Super Smash Bros. for Nintendo 3DS / Wii U, the first custom variant of Mario's Fireball is Fast Fireball, in which the fireball travels directly forward at high speed but doesn't cause knockback and deals less damage. The second is Fire Orb, which fires a larger but slower fireball that moves similarly to the standard Fireball but can hit multiple times. The custom variants for Luigi's Fireball are Bouncing Fireball, which behaves like Mario's standard Fireball, and Ice Ball, which moves more slowly but can freeze opponents. In Super Smash Bros. Ultimate, both Mario Brothers' Fireballs remain unaltered, aside from visual improvements, including brighter, flashier particle effects, as well as the appearance of smoke. However, Mario's Fireballs can now hit multiple times when used near opponents, just like the Fire Orb custom variant from the previous game. In Mario & Luigi: Superstar Saga and its remake, Mario & Luigi: Superstar Saga + Bowser's Minions, Mario throws his fireballs upon using Fire Bros. Bros. Attack in the battle. Mario is also given his fire technique known as Firebrand, which acts like fireballs, lighting all the Torches so that some location can be accessible for the Bros. In the tutorial battle with Bowser, Bowser only attacks Mario using his Fire Breath. As Rookie, he also spits fireballs alongside throwing hammers, similar to how he attacked in the original Super Mario Bros. Bowletta, a transformation between Cackletta and Bowser, also tries to breathe heavily and, after a few seconds, tries to breathe massive fire to defeat the Mario Bros. which can be done by dodging. Additionally, fireballs also appear during the final battle with Cackletta. In Mario & Luigi: Partners in Time, the Bros. Flowers is one of the Bros. Items that allows Mario, Luigi, and their baby counterparts to throw fireballs at the enemies during the battle. Blazing Shroobs, found in Thwomp Caverns, the Shrooboid Brat and Elder Shrooboid can also attack using fireballs. In Mario & Luigi: Bowser's Inside Story and its remake, Mario & Luigi: Bowser's Inside Story + Bowser Jr.'s Journey, Mario and Luigi can obtain the Fire Flower Special Attack that allows them to throw fireballs at enemies. In Mario & Luigi: Dream Team, the Fire Flower returns as a Bros. Attack, which once again allows Mario and Luigi to throw fireballs at the enemies. The Luiginary Flame Luiginary Attack also involves the use of fireballs to damage all enemies, and the Fire Bros also attack by using fireballs. In Mario & Luigi: Paper Jam, the Fire Flower once again returns as a Bros. Attack which makes the bros throw fireballs at all enemies. These fireballs deal critical damage to Paper enemies. 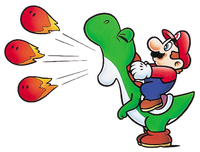 In the Club Nintendo comic "Super Mario: Verloren in der Zeit", Fire Mario uses a Fireball to defeat a Tyrannosaurus rex. Fireballs appear in The Super Mario Bros. Super Show!. They are used by Fire Mario (known as Super Mario in the show). The episode, "The Fire of Hercufleas" introduces the Great Balls of Fire, very powerful fireballs that can damage a wall. Fireballs also appear in The Adventures of Super Mario Bros. 3. Once again, they are used by Fire Mario. The episode, "Princess Toadstool for President" includes the song, "Great Balls of Fire," which is a real song. Fireballs are also produced by Fire Chomps and Fire Snakes. Fireballs reappear in the Super Mario World television series. They can be used by Fire Mario and Bowser Statues. This page was last edited on April 21, 2019, at 17:43.